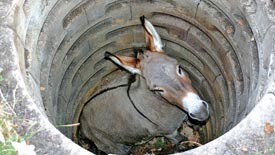 KARE 11 TV Firefighters in the western Minnesota town of Underwood weren’t quite sure what to expect when they got the call: A donkey had fallen down an abandoned well and was trapped.An unusual rescue operation followed. Firefighters quickly realized that the donkey, which belonged to a farmer named Warren Gundberg, couldn’t just be pulled from the well. So they started pulling away earth with a Bobcat tractor and dismantling the well block by block.Once the west wall of the well was dismantled, firefighters put a harness around the donkey and guided it out with a rope………………….P.S: The donkey survived with a few bruises and scratches.